An artist of the generation following Titian, Veronese is known for his broad, sweeping settings, majestic compositions and sumptuous figures. He was a key reference point for Baroque painters as well as for Giambattista Tiepolo for whom Veronese’s work was of primary importance. 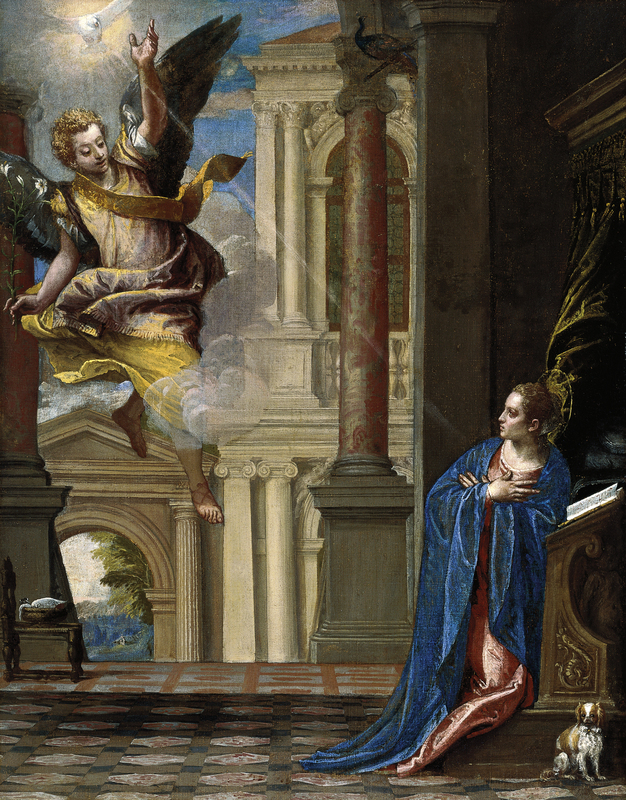 According to Philip Hendy the present Annunciation, whose provenance is unknown, was one of the first acquisitions made by Heinrich Thyssen-Bornemisza. The canvas was first published, like numerous others, when it entered the Rohoncz collection, the former name for the Thyssen-Bornemisza collection. It was first shown to the public in 1930 at the exhibition held at the Neue Pinakothek in Munich. It was subsequently included in other exhibitions that brought the works from this private collection to wider attention, including London in 1961 and Madrid in 1987–88. Since then it has been included in Veronese’s oeuvre and has been considered an autograph work. This is reflected in the commentaries by Suida, Van Marle, Berenson, Pignatti and Pedrocco. The only author to disagree with regard to its attribution was Remigio Marini who considered it a workshop production with considerable involvement on the part of Benedetto Caliari, the artist’s brother. Berenson and Heinemann dated the canvas to around 1560, but Pignatti and Pedrocco placed it in the early 1580s, considering that it was influenced by the large canvas of the same subject by the artist now in the Accademia in Venice, formerly hung in the albergo of the Scuola dei Mercanti. In both works Veronese placed considerable emphasis on the architecture, which forms an ample backdrop terminating in this case in a fine landscape and in the Accademia work in a garden. With the exception of the latter work, Veronese generally used a simpler setting for his Annunciation scenes, such as the one to be seen the painting in the National Gallery of Art, Washington, which has also been compared to the present canvas. Mary is located in the enclosed side of the composition. Kneeling at a desk, she has been interrupted in her reading by the angel. She accepts the divine message, as the position of her hands indicates, as does the ray from the Holy Spirit that enters her heart. Mary turns her body at a pronounced angle towards the delicate, graceful angel that arrives on a cloud, floating on air. The artist introduces anecdotal details into the composition such as the small dog next to the Virgin, the peacock perched above the capital of the column on the right, and the stool on which Mary’s work basket rests, carefully located in the middle-ground.